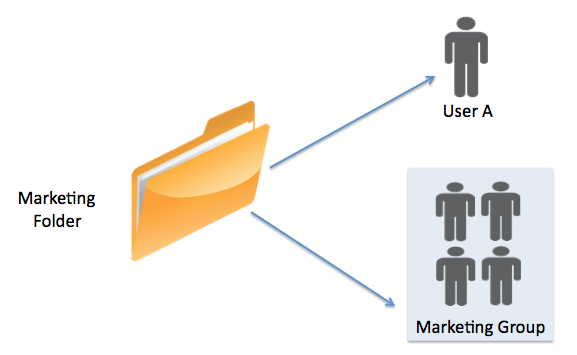 This article outlines how examples of how folder sharing works in Egnyte. To learn how to share folders and the privileges associated with different access levels, please read this article. In Egnyte, a folder and all files within are visible only when the folder is shared with a user (power user or standard user) or a group containing that user. If the folder is not shared, then that folder and all files within it are not visible. The only exception to this case is the administrator of the account. All files are folders are visible to the administrator by default. A group is any logical grouping of users that satisfies your business needs, such as a department or project team. A user can belong to more than one group. By default, folder permissions are inherited by all sub-folders. 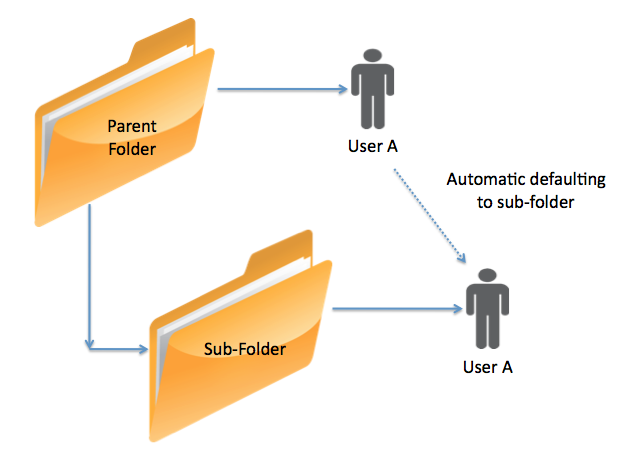 For example, if you define a folder and share that folder with users A and B when you create a sub-folder within this folder, users A and B will automatically have access to this sub-folder. There is no need for you to explicitly share the sub-folder with users A and B. Consider a folder Sales under the Shared folder on your file server. The Sales folder has been shared with users A and B. You now define two sub-folders Accounts and Collateral directly under the Sales folder. 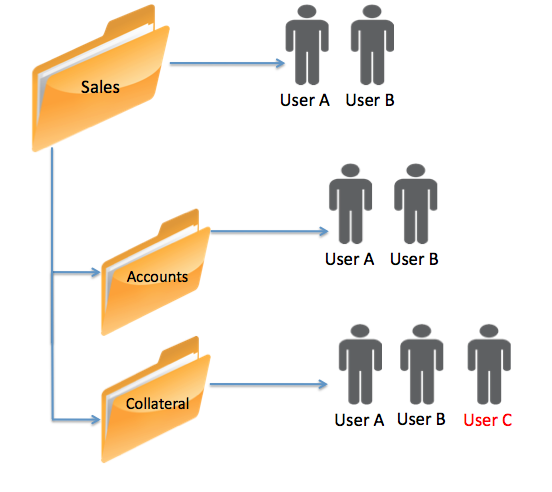 By the rules of inheritance described earlier, users A and B will have access to Accounts and Collateral. You can optionally share the Collateral sub-folder with user C. In this case when user C logs in, C will have navigational access to the Sales folder (i.e., the Sales folder will appear in grey). If the Sales folder has files in it, those files won't be visible to C, since the Sales folder is not shared with user C, and user C will see only the Collateral sub-folder of Sales. Further, user C will not see the Accounts sub-folder since Accounts has not been shared with user C.
Users A and B, however, will see Sales, Accounting and Collateral folders. Consider a folder Sales under the Shared folder of your file server. The Sales folder has been shared with users A and B. You now create two sub-folders Accounts and Collateral directly under the Sales folder. 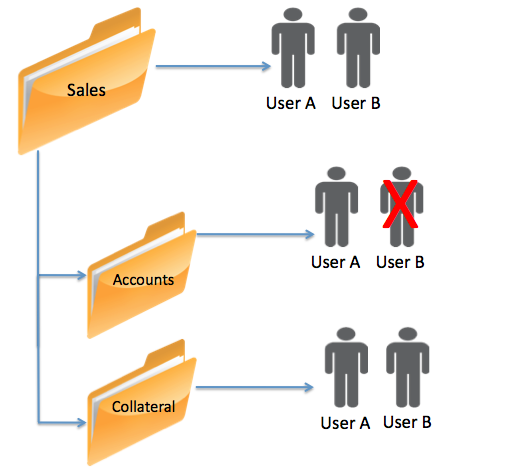 By the rules of inheritance, users A and B will have access to Accounts and Collateral. Let’s assume you do not want user B to have access to the Accounts sub-folder. You can remove user B from having access the Accounts sub-folder. We refer to this as Exclusion. In the Folder Permissions Report, there will be a None record for the Exclusion. When user B logs in, B will see Sales and Collateral folders but not Accounting. However, user A will see all three folders Sales, Collateral and Accounting. Alternatively, if the Accounts folder is a very sensitive folder and you want to make sure that when a new user is added to the Sales folder that they don't automatically get access to the Accounts folder, then you can disable folder inheritance for the Accounts folder. You may share a folder with both a user and a group. If the group also happens to contain the same user, the user's folder sharing access will override the group based access for that user. 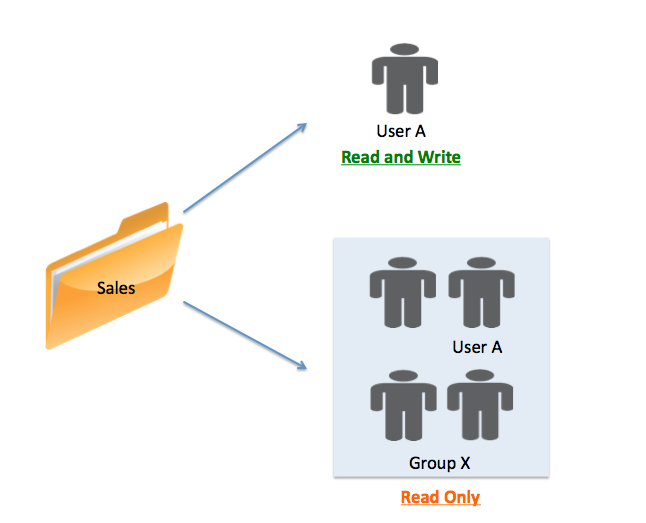 For example, the Sales folder has been shared with both User A and Group X. Group X also contains User A in addition to other users. Group X has been provided Read Only access to the Sales folder; hence User A derives Read Only access from Group X. However, User A has been provided Read and Write access directly to the Sales folder. Hence, when User A logs in, A will have Read and Write access to the Sales folder.